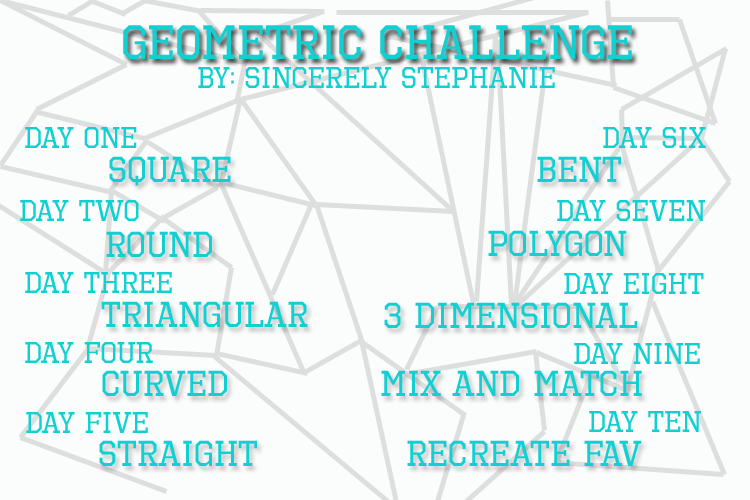 So this challenge is all about Geometry. Fun, right?? I'll include the challenge calendar at the end of the post so you can see what's next. Today's theme is "square". So I bring you squares! I decided to show off two of the new Nicole by OPI shades for 2013. Nicole by OPI Nail Lacquers and Nail Treatments contain no DBP, Toluene, or Formaldehyde. Nicole by OPI formulas are long-lasting, fast-drying, and salon-quality. These will be available in stores beginning January 2013 for $7.99 each at retailers including select Walmart, Target, CVS, Rite Aid, Kmart, Kroger, ULTA, H-E-B, Meijer and Duane Reade locations. In Canada, these shades will be available for $10.99 each at Shoppers Drug Mart, Walmart Canada, Jean Coutu, Loblaw, and London Drug. For more information, visit nicolebyopi.com. Follow Nicole by OPI on Twitter @NicoleByOPI and become a Facebook fan! I started with 2 coats of Nicole by OPI Still Into Pink a fun hot pink matte with a silver shimmer. Very easy to work with! With two coats of Seche Vite to smooth everything out. Nicole by OPI Totally in the Dark for the squares. I needed 2 coats for full coverage. You know, I have to ask...which do you like better? With or without topcoat? This looks awesome! 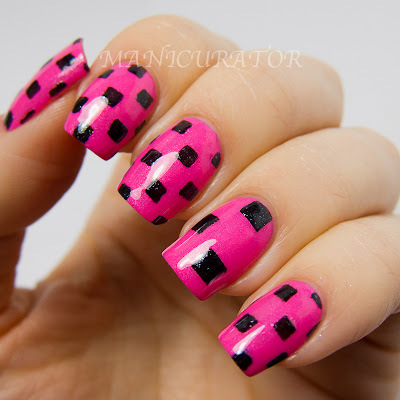 Love the black squares of that pink. I love the big squares on your ring finger! I love that pink base so much, so bright! I can relate, tape is a pain to apply combined with the fact that I'm super impatient.. it's a bad combo haha. This design looks amazing though, love it! Oh so cool! I love it just a bit more matte than gloss, but just a bit. This sounds like a mind challenging blog challenge. I hope more gals join as I love reading these sorts of things u bloggers do. Gets my brain buzzing with ideas! Oooo love this!! Great idea! Soo great, black and pink goes so well together! Love it. I like it both with and without. Makes it a completely different mani! My goodness I LOVE this! Both matte and shiny you did an amazing job! wow super cool. the squares came out perfect. Wow. You have insane patience. That ended up looking awesome though! Super fun. Thanks for sharing. Wow, so cute! I gotta say, I like it better with the top coat.